Adult content ahead. Of course this is not intended for children. ​Crabby Pants has a lot to say about the many people and situations that make Crabby feel so very, very, very, very crabby. Giveaway ends January 20, 2017. Nothing lives longer than a grudge. Color, keep track of and relive your swearable moments. Record the swearable moments that drive you crazy here so you can relive them again and again! Plus, decorate your favorite swear words and phrases with lots of color so they get the attention and respect they deserve. When you're finished with all the fun, you’ll have the perfect response when your next swearable moment happens. And you might just regain Serenity Now. Available on Amazon and coming soon to Barnes & Noble and more! is the perfect coloring book for you! Read what others have shared about their wacko bosses, and take a moment to write down your boss's stupid, mean, ridiculous, less-than-stellar moments. 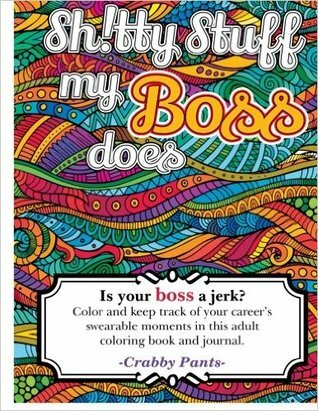 Then, color your favorite swear word for your boss and the career-limiting responses you wish you could say. There isn't an easier, more colorful, therapeutic or safe way to have fun at their expense. ​Available on Amazon, Barnes and Noble and other online retailers. ​Do you have a swearable moment or a sh!tty boss story to share? ​Send it below and watch for it to appear on the swearable moments page. If you have a coloring book page you're proud of and want to show everyone, mention it below and Crabby will make arrangements for you to upload it.